Do you sometimes wish for an angel to watch over you? Have you ever wondered what happens when your pet dies? Ranch Hero by Janet Fix is a colorful children's story about a ranch dog that passes on and becomes a guardian. Ziggy is a fearless ranch dog that loves to play with his two dog friends at their home, Sneaky Creek Ranch, until one day trouble brews and Ziggy is killed. 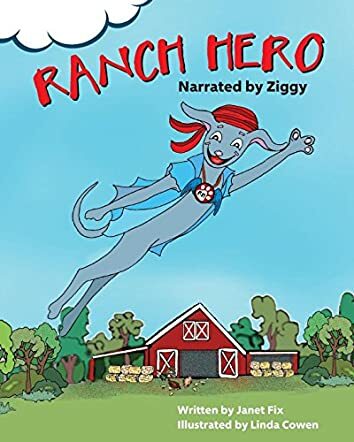 When Ziggy comes to, he discovers that although he is no longer visible to his living friends, he may still have an important purpose; to guard his ranch friends from certain dangers. Follow Ziggy as he travels from a happy home on the ranch to an adventurous afterlife. Only, can an angel with new wings protect his friends? Will Ziggy be satisfied in his new role as a Ranch Hero? Ranch Hero by Janet Fix is a vividly written children's story that explains death and the afterlife to kids in an easy to understand and compassionate manner. It can be hard to define what happens to our beloved furry friends after death, but this book can be used to ease the awkwardness and pain. I admit that I was expecting a story line similar to Hank The Cowdog; however, this book is not anything like the Hank series, but it still has its place on the family shelf because it teaches several essential and hard to understand lessons. Although the book is short, I believe that younger children will enjoy Ziggy's adventures and the illustrations, particularly the donkeys' comeuppance. If you are hard put to figure out how to tell your child about their pet's recent death, then this book is a great starting place. I enjoyed reading this book. I feel that it can help heal a child's broken heart over the loss of a pet or even a loved one.